collections agency hounded him for a bogus $100 T-Mobile charge. The Federal Trade Commission (FTC) is charging that T-Mobile spent years cramming its customers’ bills with unauthorized charges from horoscope lines, gossip lines and similar fraudulent subscription services long after the company realized they were bogus, making “hundreds of millions of dollars” off the back of scammed customers. 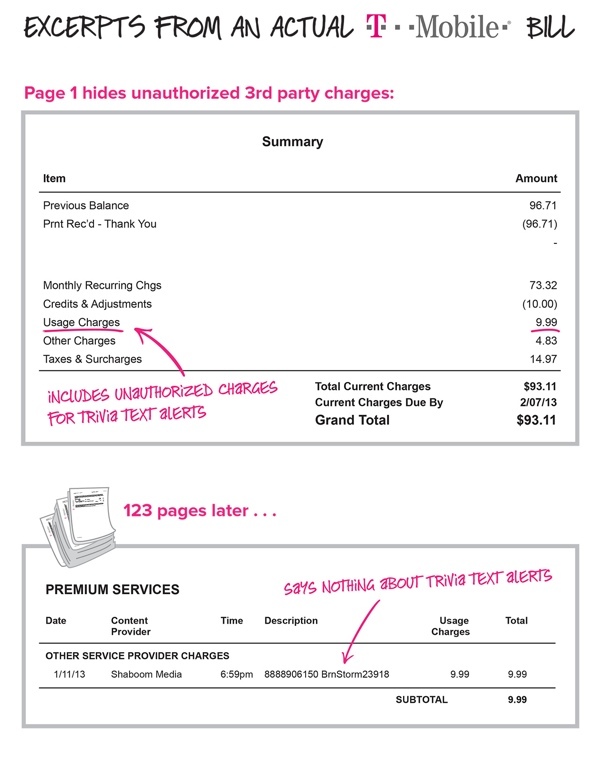 According to the complaint, T-Mobile hid charges associated with these scams on customers’ bills under bizarre codes like "8888906150BrnStorm23918" and innocuous-sounding headings like "Usage charges." Pre-paid customers didn’t get bills at all, giving them no way to know that their higher monthly debit deductions were a result of fraud. The recurring charges cost customers as much as $9.99 per month. Of course, cramming isn’t a T-Mobile exclusive – all carriers have dealt with bad guys who try to sneak fraudulent phone charges onto bills. The biggest difference is how T-Mobile allegedly handled the problem once the company realized it existed. Rather than immediately go after the crooks and stop their schemes, T-Mobile is charged with intentionally profiting off them, collecting a 35-40 percent cut of the proceeds. And when customers did complain, T-Mobile allegedly protected their ill-gotten gains by refusing to offer full refunds. Some victims are said to have been instructed to chase after the third-party scammers for the balance, without being given accurate contact information to do so. "It’s wrong for a company like T-Mobile to profit from scams against its customers when there were clear warning signs the charges it was imposing were fraudulent," said FTC Chairwoman Edith Ramirez. "The FTC’s goal is to ensure that T-Mobile repays all its customers for these crammed charges." 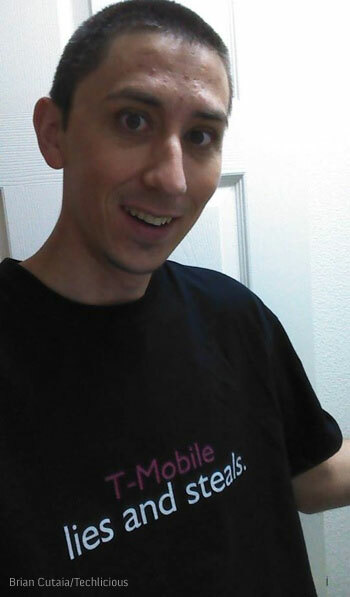 To be sure, T-Mobile is contesting the complaint, with CEO John Legere calling it "unfounded and without merit." "T-Mobile stopped billing for these Premium SMS services last year and launched a proactive program to provide full refunds for any customer that feels that they were charged for something they did not want," Legere explains in a statement. T-Mobile has been trying hard over the last year to rehabilitate its image and position itself as the "uncarrier" – a quality mobile phone service provider that doesn’t play the same kind of anti-consumer games like the big boys do. Unfortunately, this complaint (rightfully) makes the company look worse than its competition. You can read the full FTC complaint against T-Mobile at the agency’s website.